The Archaeological Institute of America is pleased to announce our 2016 Award Winners. For his work in the field at Morgantina and his highly successful leadership in the effort to combat the illegal excavation, export, and sale of antiquities in Italy. For her pioneering research and global recognition in zooarchaeology; her innovative work in the application of archaeology and genetics in documenting the domestication of plants and animals; and her widely used morphological criteria to reliably distinguish between animal bones of closely related species. For his many years of devoted service to the AIA as a Trustee and Treasurer and his involvement in AIA fund-raising efforts. For the book’s offer of a new structure and method for integrating land and marine archaeology and history in a stimulating and accessible way. For the book’s clear and engaging style in using archaeology along with historical records and ethnological research. For her three decades of engaging and enriching those she teaches and her multidisciplinary approach to the classical world. For their work in developing, implementing, and maintaining an Archaeological Management Plan for the City of Toronto. For the diligent work to preserve, protect, and promote the Black Creek Indian Site through the implementation of an interpretive plan and cultural resource program that involves close collaboration with state and national officials. For her prominent and dedicated work to raise public awareness of the need to safeguard archaeological heritage. 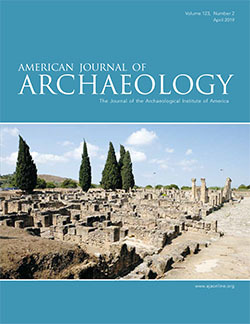 For its significant contribution to the preservation, curation, and publication of archaeological data through a free, open-access and innovative approach to the management of archaeological data. For her paper, which presented carefully researched conclusions that were both coherent and persuasive. For her paper’s important contribution about the Athenian Agora in Late Antiqutiy. Please join us in honoring these award winners at the Awards Ceremony on Thursday, January 7, 2016 at 5:30 pm during the Annual Meeting in San Francisco, CA.